Furniture makes the best focal point in interior designing. With its imaginative and innovative Western details our Rancho Chulo bar stools are a perfect option for an interior design choice in your home. This particular Rancho Chulo bar stool is upholstered with rich brown colored full grain leather on the seat and inside seatback, and with exotic fine blue suede fabric on the reverse seat back. 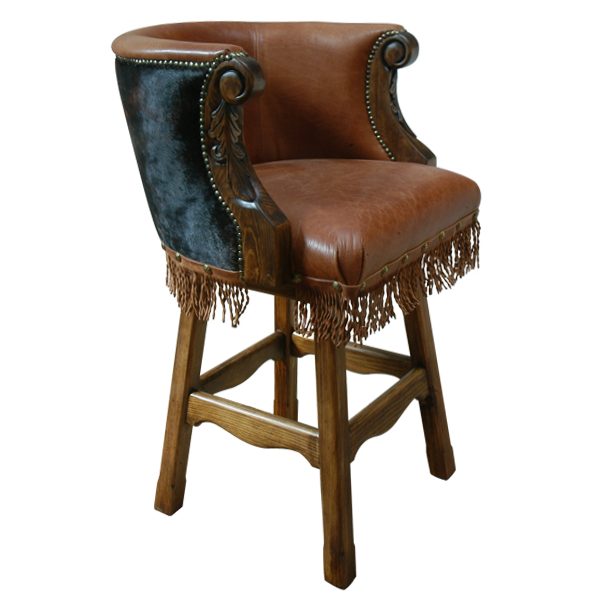 The Western traditions are continued in this bar stool with its matching rich brown colored genuine leather fringe hand tacked around all sides of the base, and hand forged iron nails on the lower part of the base. This bar stool also has beautiful ornate hand carved floral and scrolled details on the armrest. The entire bar stool sits on splayed solid wood legs joined by a curved cut foot rest box stretcher. The bar stool swivels 180° and is 100% customizable.